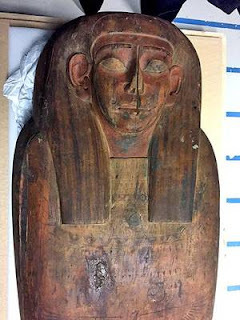 Australian academics could help unlock mysteries around ancient Egypt after discovering that a 2,500-year old coffin might contain the remains of a prestigious mummy. The University of Sydney acquired the coffin 150 years ago and a series of academics incorrectly classified it as empty. Their error was only discovered by chance late last year when more recent academics removed the lid to the coffin and discovered the tattered remains of a mummy. The discovery offers scientists an almost unique opportunity to test the cadaver. “We can start asking some intimate questions that those bones will hold around pathology, about diet, about diseases, about the lifestyle of that person — how they lived and died,” said Jamie Fraser, senior curator at the Nicholson Museum at the University of Sydney. Whole mummies are typically left intact, limiting their scientific benefits. Adding to the potential rewards is the possibility that the remains are those of a distinguished woman of an age where little is known, Fraser said. Hieroglyphs show the original occupant of the coffin was a female called Mer-Neith-it-es, who academics believe was a high priestess in 600 BC, the last time Egypt was ruled by native Egyptians. “We know from the hieroglyphs that Mer-Neith-it-es worked in the Temple of Sekhmet, the lion-headed goddess,” Mr. Fraser said.